With (L-R) Stephen Weiss, Henrik Zetterberg and Jimmy Howard all injured, realignment has never felt like a better idea in Detroit. At least the Detroit Red Wings have an impeccable sense of timing, because that’s about the only that’s gone right for them this season. And in a season of bad breaks, bad news and bad clutch play, Wednesday may have been the worst day of them all. On Tuesday, the Red Wings took the ice with star Pavel Datsyuk in the lineup for the first time since Nov. 23, and he paid immediate dividends with a goal and an assist as Detroit carried a 2-0 lead into the third period. Unfortunately, they also had Jimmy Howard in the lineup — like he has done so many times before this season, the beleaguered goalie turned what looked like a solid win into a heartbreaking loss, surrendering a pair of third-period goals en route to a 3-2 shootout loss at Florida. Howard had a hard time holding on to leads this season, taking the loss in games in which the Red Wings held the lead after two periods six times according to hockeyreference.com. It also didn’t help Detroit that captain and leading scorer Henrik Zetterberg was the one guy out of the lineup Tuesday, still sidelined by a herniated disk. So as a new day dawned, the team set its sights on righting the ship. But instead, the S.S. Red Wing sprung another leak, as the team placed Zetterberg on long-term IR, meaning he won’t be available until just before the new year at the earliest. UPDATE: The #RedWings have placed Henrik Zetterberg on long-term IR; he can return on Dec. 28 against Florida. As for Howard, GM Ken Holland to the Detroit Free Press: "Howie tweaked a knee. He’s going for tests. We don’t know how serious it is. Obviously, he can’t play, so we called up [goalie Petr] Mrazek." 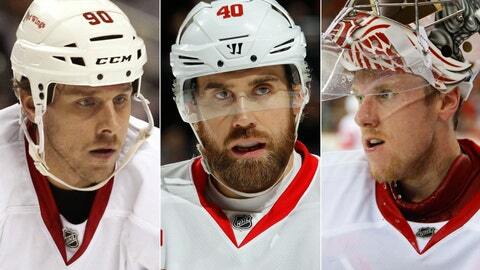 So about the only the Red Wings have going for them is that timing. You see, Detroit is in its first season as a member of the Eastern Conference, and currently sits fourth in the conference and third in the Atlantic Division with 38 points. You put that same team in the West and you’re looking at 10th place in the conference, two points out of a playoff spot, and heading toward the halfway mark of the season without your captain and perhaps your No. 1 goalie.